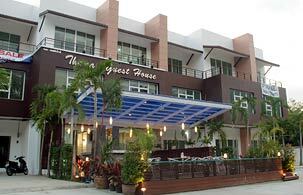 Thana Guesthouse is a newly constructed luxury guesthouse. It has a friendly yet informal atmosphere so you will find yourselves a warm hospitality from the very first day. We offer clean and comfortable rooms with consistent and excellent service that will ensure your comfort every moment with us. Enjoy the beautiful mountain views from room terrace, have a gourmet dining in our open-air seafood restaurant & bar, or relax with an outdoor patio downstairs designed for our guests to chill-out and share a casual evening time with friends. Ideal for friends, families or individuals. Setting in a convenient location for many attractions in Phuket. Thana Guesthouse is close to the banks, shops, bars, and the lively beach. 10 minutes by walking to Kata and Karon Beach. 5 minutes to Shopping Centre and Entertainments. 50 Minutes from Phuket International Airport.